Organic gardening has experienced an upsurge in popularity, mainly due to concerns about commercial farming practices and their harmful effects on the environment. Manures are organic mediums for soil preparation and plant nutrition. While their effectiveness is not under dispute, their safety may well be. So even though manure fertilizer advantages are not in debate, the reasons against fertilizing with manure could put into question whether or not this is a practice in which you’d like to partake. Improves the soil. Some of the greatest benefits of manure in the garden are that manure increases soil carbon, while also reducing atmospheric carbon. Soil carbon stimulates the biological process of soil, making it more alive by increasing microorganisms and allowing soil nutrients to become more readily available to plants growing in the manure amended soil. Because it is organic, manure added to garden beds also improves soil structure and aeration, reduces erosion and leaching of nitrogen, and increases the soil’s water holding capacity and drainage. High in nutrients. Manure is high in nutrients that plants need to grow properly, such as nitrogen, phosphorus, potassium, calcium and magnesium. Different types of animal manure have different levels of these nutrients. For example, sheep and poultry manure are higher in these nutrients than horse or cow manure. However, raw manures can contain levels that are not safe for some plants. For this reason, manures are usually composted or cured before using in the garden. When composted properly, with a carbon-nitrogen ratio of 25:1 and at least three to five days of steady compost temperatures of at least 131 F. (55 C.), manure is free of harmful contaminants and high salt levels. The composting process also breaks down the nutrients into forms which are easier for plants to absorb and can be easily applied right to growing vegetable plants. Easy to come by. 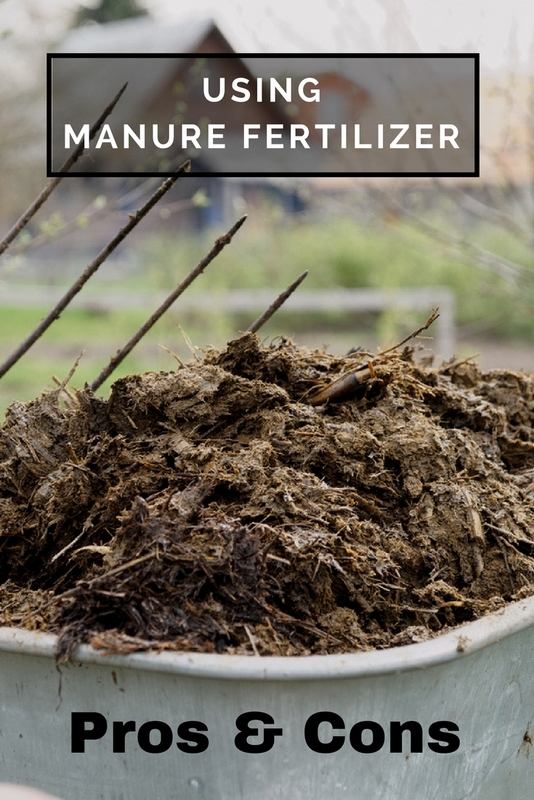 Other benefits of using manure in the garden are that it repurposes livestock waste and it is generally much lower cost than commercial fertilizers. Manure is also usually easy to come by. Many people with livestock have an endless supply and a lot of them are more than willing to share with others. Bonnie’s viewpoint: If you really think about it, using animal waste as a fertilizer is mildly disgusting. However, properly cured and composted manure is an excellent source of nitrogen and other nutrients and helps improve soil health. Some of the drawbacks of manure fertilizer come when it is not composted well and when animals are given medicines and hormones which may remain in the finished product. Here are a few good reasons why you shouldn’t fertilize with manure. Manure should be composted first. There are two main types of animal manure, hot and cold. Hot manures have high amounts of nitrogen and must be well composted. These include rabbit, horse, sheep and cow manures. Cold manure is lower in nitrogen and can be used in moderation in its fresh state. Both types should be worked into soil well at least two months prior to planting edible crops. In organic production, no manure can be used in the year in which a crop will be harvested, so for organic certification only green manures should be applied to soil. Contaminants may still remain. The bad news is that even composted manure can still retain hormones, antibiotics, viable weed seeds, pesticides and diseases. In fact, while rare, Salmonella and E. coli have both been found in well composted manures and can be transmitted to food crops, especially those that are eaten raw. Heavy metals are another concern. In livestock situations where industrial production systems are used, heavy metals and chemicals are often taken in by animals and do not disappear when the manure is composted. Raw manures are especially dangerous and can release high levels of skatole, indol and other phenols which are absorbed by food crops. May lead to excess nutrients. Other reasons against fertilizing with manure are that soil health can be affected by consistent use of the product. It imparts necessary plant nutrients but may cause a build-up of certain nutrients and minerals. These excess components leach out of soil and run off into waterways. Excess nitrogen in water causes algae blooms and other effects. Copper is an additive in many poultry feeds. Chicken manure retains that copper and can build up to soil to a toxic degree, burning plant roots. Another of the cons of using manure fertilizer is that it can raise the acidity of soil over time while also depleting calcium, an essential mineral for plants. Manure needs to be tilled into be most effective. The very action bares soil and leaves it open to further leaching and topsoil loss. Overall, manure is an effective fertilizer and soil amendment when used properly. The cons of using manure fertilizer are generally outweighed by the positive aspects of the product. However, the drawbacks of manure fertilizer certainly do exist and steps need to be taken to avoid issues. These might include soil testing to determine the amount and type of manure, using low tillage methods by spreading manure the season prior to planting, and sourcing manure from organic farms where toxic chemicals are not used. With careful composting, manure can be of benefit to plants and soil. Note: It is strongly recommended that cat, dog and pig manures never be used on edibles, especially raw, because of parasites and disease contaminates.